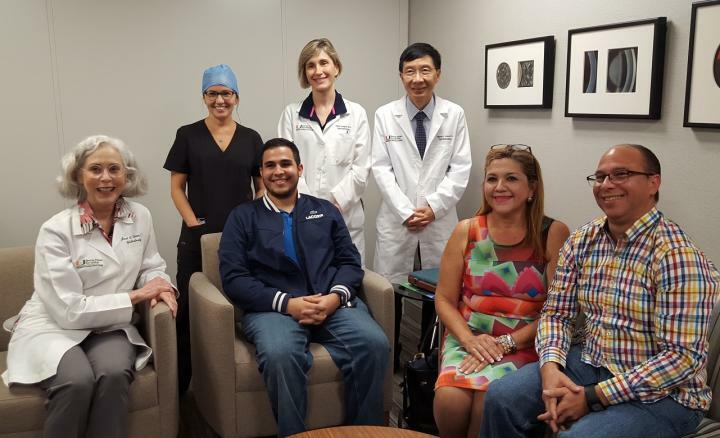 A Puerto Rican patient with X-linked retinitis pigmentosa (XLRP) is hoping to save his vision after an innovative gene therapy procedure at Bascom Palmer Eye Institute at the University of Miami Miller School of Medicine. On August 23, Julio Adorno Nieves, 23, became the first U.S. patient to be given new genes for his inherited blinding condition in a worldwide Nightstar Therapeutics clinical trial. "My vision has been getting worse over time, and I've had a lot of difficulty seeing at night," said Nieves at a checkup one week after his surgery. "I'm still in recovery, but am hoping to see a change soon, thanks to Bascom Palmer's fantastic professional team." Bascom Palmer has an extensive gene therapy program with ophthalmologists, surgeons, genetic counselors and research scientists studying various forms of inherited eye diseases. Byron Lam, M.D., professor of ophthalmology and holder of the Robert Z. & Nancy J. Greene Chair in Ophthalmology, said XLRP is most commonly caused by a mutation on the RPGR gene on the X-chromosome that causes blindness in about one in 15,000 men. Because women have two X chromosomes, they are usually less affected, although they can pass the mutation to their children. "Introducing a functional copy of the RPGR gene using an engineered viral vector can correct the underlying cause and induce a long-lasting therapeutic effect," added Lam, who is the principal investigator in the phase 1/II Nightstar clinical trial focusing on the safety and dosage of the treatment. Janet L. Davis, M.D., professor of ophthalmology and holder of the Leach Chair in ophthalmology, and Ninel Gregori, M.D., associate professor of clinical ophthalmology, delivered the new genes to Nieves' left eye in a 99-minute procedure that was observed by Robert MacLaren, M.D., a professor of ophthalmology at the University of Oxford in the United Kingdom who developed the gene replacement therapy. "Julio's surgery went very well, and we were able to cover the entire central area of the retina where he still had some limited vision," Davis said. Noting that Nieves was the 16th patient worldwide to participate in the Nightstar trial, Gregori said, "We put a lot of planning into this ground-breaking surgery and are proud that Bascom Palmer Eye Institute was the first U.S. site for this clinical trial. Our patient and his family were waiting for this for many years!" The patient's parents, Santa Nieves and Jorge Adorno Giusti, both pharmacists from Bayamon, Puerto Rico, are hoping the experimental treatment will also help their other two sons, Jorge, 25, and Juan, 21, who also have XLRP. "About 30 members of my family have this genetic disorder and many of the men are legally blind," said Santa Nieves. "Before we decided to have children, I consulted with several specialists and had genetic testing done. They assured me at that time that I was not a carrier of the disease, so I expected to have healthy children." But when Santa Nieves' children started walking, she noticed they were bumping into the edges of doors, an early symptom of the loss of peripheral vision due to retinitis pigmentosa (RP). "But they were not diagnosed with RP until 2002 when they were 7, 9 and 11 years old," she said. "They told us they were destined to lose their sight irreparably." A doctor in Bayamon urged Santa Nieves to contact Bascom Palmer, which has deep ties to Puerto Rico's ophthalmology community. Jose A. Berrocal, M.D., the first fellow to train at Bascom Palmer in 1964, became the island's first retina specialist. His daughter Maria Berrocal, M.D., joined him in private practice, while Audina Berrocal, M.D. joined the Bascom Palmer faculty and is now professor of clinical ophthalmology. Responding to Santa Nieves' request, Audina Berrocal tested Santa Nieves' sons, determined they had XLRP and referred the family to Lam for genetic testing. In 2003, Lam and Berrocal led a Bascom Palmer medical team that tested more than 100 members of Santa Nieves' family in Puerto Rico. "We used my sister's and dad's office to examine as many of the family members as we could," said Berrocal. "It was an amazing collaborative project." Through the years, the Bascom Palmer physicians stayed in close touch with the family, and when Lam was asked to participate in the Nightstar gene therapy trial, he thought immediately of the Nieves family. "With gene therapy, some patients will have their central vision improve, while others may not," Lam said. "Hopefully as Julio's central vision improves, his night vision will get better as well." Meanwhile, Julio Nieves, now a computer scientist, urges other men with XLRP to keep learning about the disease and seek out new treatments. "I hope that my two brothers can also be treated," he said. To help raise awareness, Santa Nieves established the Retinitis Pigmentosa Foundation of Puerto Rico, a non-profit Puerto Rico organization to educate families, provide support to patients and inform them about the latest advances. With guidance from Bascom Palmer, the foundation plans to create a central database for RP patients on the island. After Julio's surgery, Santa Nieves expressed her "unconditional thanks" to Lam and the entire Bascom Palmer team. "After 15 years of waiting, my dream has come true," she said. "Miracles happen and great people make them possible!" Bascom Palmer Eye Institute, a University of Miami Hospital and Clinic, is ranked the nation's best in ophthalmology by U.S. News & World Report, an honor it has received for the 17th time. Ophthalmology Times also ranks Bascom Palmer #1 in the country for its overall ophthalmology program, clinical care and residency programs. In addition to its international reputation as one of the premier providers of eye care in the world, Bascom Palmer is the largest ophthalmic care, research and educational facility in the southeastern United States. Each year, more than 250,000 patients are treated with nearly every ophthalmic condition and more than 18,000 surgeries are performed. With five patient care facilities in Florida (Miami, Palm Beach Gardens, Naples, Plantation and Coral Gables at the Lennar Foundation Medical Center), the Institute serves as the Department of Ophthalmology for the University of Miami Miller School of Medicine, part of UHealth-University of Miami Health System. Bascom Palmer faculty members also staff the Miami and West Palm Beach Veterans Affairs Medical Centers, Jackson Memorial Hospital and Miami Children's Hospital. For information on Bascom Palmer Eye Institute, contact Kai Hill or [email protected] or visit http://www.bascompalmer.org.